Each participating artist was given an orphan/ooak bead created by artist Patricia Handschuh of The Color of Dreams Boutique to design with. We were to create something with it and post on our blog April 6, Sunday. I received a little round polymer clay bead with floral canes. Being a polymer clay artist myself, I know what it's like to make small beads. I don't make them very often. As for my dream? My dream is that everyone may experience beauty during their day. A garden, a smiling face, a giggling child, a piece of art... whatever makes them feel alive. 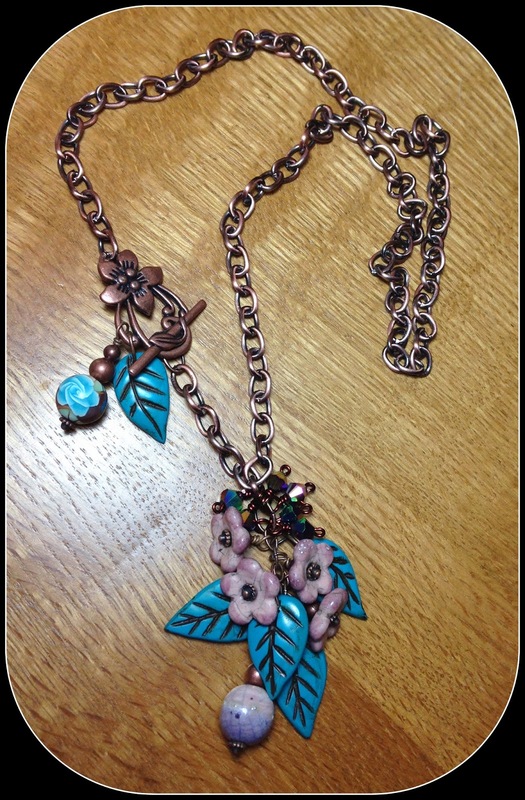 I chose to use a coppery chain and clasp, and used the clasp as part of an accent in a necklace, bringing it to the front. I hung the little bead on the clasp. Then I created my own sculpted leaf beads, and antiqued them. I used my friend Bonnie Polinski's ceramic flower beads and one of her ceramic rounds as well as some sparkly crystals and more of my leaf beads to create a dangle as the focal. A beautiful concept - I like how you were able to create more bits around the original bead, to enrich it. Love the necklace: so simple, and yet so elegant! What a beautiful necklace! It has all the elements I love, classic design, a bit of girly, supreme wearability! Jael, wow!! Your necklace is stunning! It's beautiful. I love your dream -- as beautiful as your jewelry, Jael! I love the colors and asymmetry of this necklace! What a beautiful necklace! I absolutely love the combination of colors, and the way that you used the clasp as an accent (and those leaf beads, and the Color of Dreams bead, and...). This is a great design where the bead is part of a color coordinated garden. Super cute. I really like what you did w/ your bead. We got the same one, & it is so interesting to see different results. Jael your necklace is very pretty. You did a great job of picking colors to highlight the bead. I am in love! The colors of your necklace and the flow is just spot on. And it looks so comfortable to wear and just my style. Beautiful! Using with the other beads really made it pop. Great job and thanks for posting! The colours work perfectly. A beautiful piece indeed. What a nice dream, and love that necklace!!!!!!!!!!!!!!!! What a nice dream, and I LOVE that necklace!!!!!!!!!!!! Color wow. Wonderful and enjoyable. What a great looking piece - it's neat. I love your necklace! The beads you made are wonderful and work beautifully with your original bead. The colours are great together and I really admire how you managed to make the asymmetry work. Those are two areas I want to work on....polymer clay AND asymmetrical design. Thank you for showing me how an expert does it. Another dream for me. Gorgeous necklace, your leaves perfectly showcased the bead. Everything works so well together, beautiful design! This is AWESOME necklace, Elegant I love it!! really beautiful, indeed! i LOVE copper with blues - so timeless and classic! Jael, what a pretty necklace! Your leaves are just the right color & so pretty! I also love the movement this necklace has. It will be FUN to wear! The leaf beads you created go wonderfully with our bead and really set it off. Love the copper and the necklace as a whole. Your dream is great. I really love the design. Great colors and movement. Nice Job!! This piece is so lovely and elegant, I could see it go with about anything ! Sorry this comment took so long, this week has been a little heretic. What a ♥beautiful necklace. There's so much 'to see' in it! All those little details, I love it. Gorgeous beads and a ♥gorgeous stylish design. Wow! What a beautiful piece!